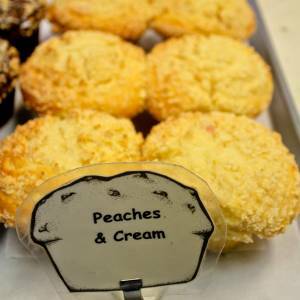 Peaches & Cream is an expression that implies an ideal paradise. And rightly so. That’s why Frank Michaud got the recipe in the first place. To bring us back into Eden one bite at a time. Written in Birdsong, this recipe is thousands of years old. Apparently it was a delicacy used by Egyptian priests, which can be seen in many hieroglyphs throughout the Giza Plateau. Alexander took it to India during is world campaign. St. Patrick fed it to the Irish. King of the Franks Charlemagne ate it exclusively, only taking it, wine, and water for sustenance. Which makes Frank like Indiana Jones meets Despereaux.